Subject: Salcombe from Bonfire Hill circa 1950, lovely early summer colours, signed and inscribed on backboard. A painter in both oil and watercolour and a print maker. 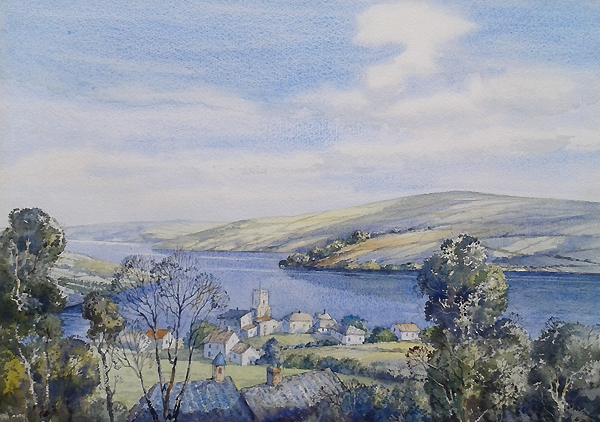 His subjects are mainly westcountry landscape and coastline. In recent years the city of Venice and the coast and countryside of Spain have provided his inspiration. He was born in London, the Son of the Scottish artist James Greig and trained at Southend School of Art. In 1954 he moved with his family to an old farmhouse near Kingsbridge in Devon, his wife is the artist Rita Greig. A member of the Royal Society of Marine Artists, he was awarded the Gold medal, Paris Salon and is a Fellow of the Royal Society of Arts.